Deal of the day: Volkswagen e-Golf | What Car? The Volkswagen e-Golf has all the usual advantages associated with electric car ownership. It delivers its power in a smooth, silent and effortless manner and, like many electric cars, feels genuinely fast accelerating from a standstill to town speeds. It also has no tailpipe emissions, which means it’s tax- and congestion charge-free. The beauty of the e-Golf, however, is that it also functions as a regular Golf, meaning it has a classy cabin, lots of space for passengers and, despite the battery pack, has a reasonably big and evenly shaped load area. For those not willing to compromise on normal car ownership, the e-Golf may be the perfect stepping stone to electric power. It’s well equipped, which is just as well considering this isn’t a cheap car. It comes with alloys, Bluetooth, sat-nav, DAB radio, auto lights and wipers, climate and cruise control, and all-round parking sensors. It can be charged from a standard household three-pin socket, taking a leisurely 13 hours, or you can specify a home charger that cuts this time to eight hours. It can also be charged from rapid chargers, enabling an 80% charge in as little as 35 minutes. Just as it comes with all the usual electric car advantages, it also comes with all the associated disadvantages, predominantly range anxiety. Our independent testing suggested a range of 87 miles on a full charge. This is fine for a daily commute but means you cannot run the e-Golf as your main car if you might need to travel farther. Equally, batteries degrade over time, so you’ll eventually have to get them repaired or replaced. Also, electric cars haven’t been a fixture on the UK’s roads for long enough to collate meaningful reliability figures, so there’s no saying for sure how they will fare in the long run. The BMW i3 was designed from the ground-up as an electric car so is better suited to that role, with its cleverly designed cabin. It will also prove cheaper in the long run as a company car purchase. 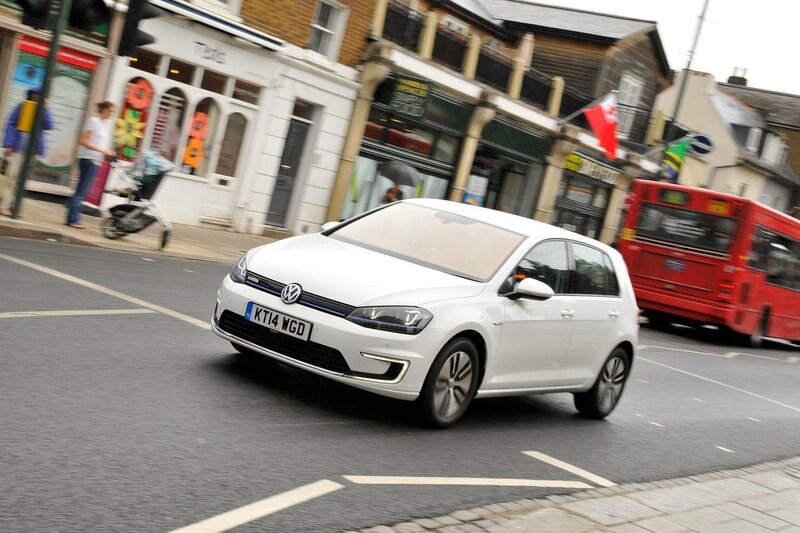 We’d advise against it as all the key options are included as standard and the e-Golf is already an expensive car. Head to uknewcars.com and select Volkswagen and Golf to see the full range of deals across the petrol-, diesel- and electric-powered Golf range.